THE BEEHIVE STATE, covering an area of 84,990 square mi (220,124 square km), is located in the southwest United States and features a dry, mountainous topography. 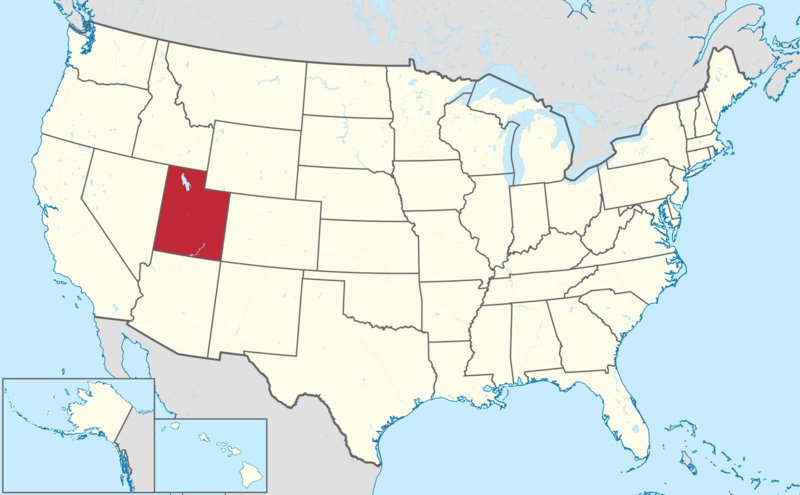 Utah is rectangular in shape, except for a small corner cut away in the northeastern portion of the state. The state is bounded to the north by IDAHO and WYOMING, to the east by COLORADO, to the south by ARIZONA, and to the west by NEVADA. At the southeastern corner of Utah is the junction that is known as “the Four Corners,” the point where Utah, Arizona, NEW MEXICO and Colorado meet. The lowest point in the state is more than 2,000 ft (610 m) above sea level and the highest point is Kings Peak at 13,528 ft (4,123 m). The presence of subranges of the ROCKY MOUNTAINS means there are peaks over 9,842 ft (3,000 m) in height. The unique geology of Utah can be seen in its many national parks and monuments, including Canyonlands National Park, Zion National Park, and Bryce Canyon National Park. Colorful and dramatic natural features such as canyons, sandstone outcrops, stone arches and bridges, rock spires, cliffs, gorges, and mountains can be seen in locations across the state. The major rivers in Utah are the Colorado River and the Green River, both in the eastern half of the state. Much of Utah is either arid or semiarid, with many areas receiving less than 10 in (25 cm) of rain annually. The Great Salt Lake is one of the unique features of the state. At about 4,200 ft (1,280 m) in elevation, the lake is several times saltier than the oceans of the Earth. The lake varies in size, but the average is about 1,700 square mi (4,403 square km). Because of the extreme saltiness, there are no fish in the water, and recreation is limited to sailing because of the corrosive nature of the concentrated salt. The Great Salt Lake Desert is in the northwest portion of the state and is part of the Great Basin Desert that covers several states. Major cities include the capital, Salt Lake City, as well as Provo and Ogden. Summers are hot and winters are cold. Tourists go to Utah to see the natural splendors and for outdoor activities such as hiking and skiing. The 2002 Winter Olympics were held in Salt Lake City, Utah. They are also drawn to the capital city to see, among other sights, the giant Mormon Temple. The first European explorers to venture into what is now Utah were a party led by two Spanish priests. Their six-month-long mission began in July 1776 but did not lead to any permanent settlements. The Latterday Saints, also known as the Mormons, were the first settlers in the 1840s. Their leader, Brigham Young, was seeking a place to settle where the Mormons could be left alone after the founder of the Mormon faith (Joseph Smith) had been murdered back east. Young reached the site of Salt Lake City and declared that was the spot where the Mormons should settle. In 1865, the Black Hawk War broke out with the local Native American tribes, including the Utes and Paiutes. Intense hostilities between the Mormons and the natives continued until 1867, and then intermittently until 1872, when federal troops finally arrived. An important milestone in history occurred in 1869, when Utah was the scene where the golden spike was placed upon the completion of the transcontinental railroad at Promontory Point. The discovery of silver and gold in Utah helped spur growth. Utah became the 45th state to join the Union when it was admitted in 1896. The construction of two key dams in the late 1950s helped add to the water supply and encourage tourism. The Mormon presence in Utah has remained strong over the years, and about 70 percent of the population is still Mormon.